​Why are our blueberries so good? Growing blueberries is a lot of work, especially in Florida! But, seeing those delicious little orbs turn from green to blue makes it all worth it. We pick the best varieties for our climate, and grow them according to Agricultural Best Management Practices (BMPs) determined by the Florida Department of Agriculture and Consumer Services. We are also inspected every year before harvest by a Global Food Safety Auditor, as well as random inspections throughout the year from the State of Florida Agriculture Department. Cancer fighting anti-oxidants - The pigment that makes blueberries blue makes them the number one source of anti-oxidants which consume cancer causing free radicals. Anti-aging/memory enhancement - Can't find your car keys? Eat more blueberries. Blueberries have been demonstrated to improve memory. Reduction of cardiovascular disease and stroke - Blueberries are rich in compounds that reduce bad cholesterol and improve cardiovascular health. Infection fighting - A compound in blueberries has been demonstrated to fight urinary infection and is being considered as a pharmaceutical. 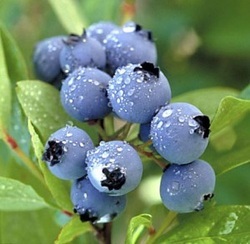 Improved eye﻿sight - The European relative of the blueberry, the bilberry, has been demonstrated to improve visual acuity. The amount of scientific research demonstrating the unique benefits of blueberries is truly amazing and seems to be accelerating.